From the Hancock County Courthouse, go north on Hwy 15 for 6.9 miles. The cemetery is on the east (right) side of Hwy 15, directly across the street from where County Rd 7 (Lovejoy Road) dead ends into Hwy 15. The cemetery is about 200 feet from the highway on a small rise. There are only two graves visible. 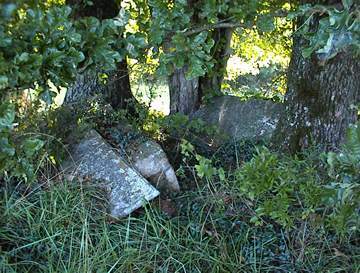 The gravestones (slabs) have been tilted and sit atop brick vaults. Dates per Kimbrough. Gravestone unreadable, except for name, in 2003. Age 56. Date, age per Kimbrough. Gravestone, except for name, is unreadable in 2003.